Before the Civil War, the Ohio River marked the separation between southern States that accepted slavery and the free northern States. Border communities along the river became hotbeds for Underground Railroad activity as enslaved freedom seekers crossed into Indiana where free African Americans and anti-slavery whites sheltered them and helped them move further north. Madison’s location along a shallow, narrow section of the Ohio River made it an ideal crossing point, and various creeks draining into the river created easy-to-follow paths northward into rural Jefferson County. Proximity to the Ohio River gave rise to Madison's Georgetown Neighborhood, a community of free blacks dating back to the 1820s. About 50 African-American families lived in the Georgetown neighborhood, located along Walnut Street north of Main Street. During its peak years in the early 1850s, Georgetown boasted a population of almost 300. 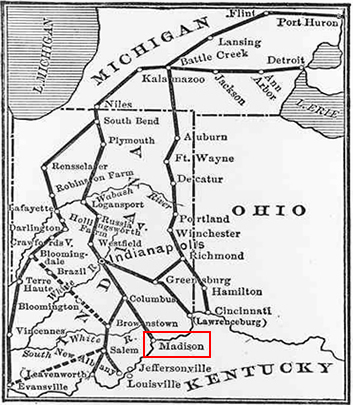 Mob violence threatened southern Indiana’s free black communities during the 1840s and 1850s, causing some of Madison’s Underground Railroad leaders such as George DeBaptiste to relocate, but others stayed in Georgetown and continued to help slaves move north until the end of the Civil War. George DeBaptiste, a well-known Underground Railroad conductor, settled in Madison in 1837. The son of a wealthy, free black family in Virginia, DeBaptiste traveled and worked on Ohio and Mississippi River steamboats as a young man. He started a wholesale shipping venture after moving to Madison in 1837. He gained notoriety for legally challenging the 1831 Indiana law that required African Americans to post a $500 bond to live in the State. After serving as President William Henry Harrison’s “steward of the White House” during the president’s short term, DeBaptiste returned to Madison in 1841 and opened a barber shop at Walnut and Second Streets. This shop became the center of Georgetown Underground Railroad activity with accounts of DeBaptiste helping over 180 freedom seekers between 1841 and 1846. He then moved to Detroit, Michigan, where he continued his anti-slavery efforts. While the barbershop no longer exists, the modest brick buildings on Walnut north of Main Street still look much like they did during DeBaptiste’s time. Born to a free black woman and later bound to a slave owner, William J. Anderson escaped from a steamboat while traveling on the Ohio River and settled in Madison around 1836. He acquired masonry skills and built a Federal style home at 713 Walnut Street for his wife and himself in 1846. An outspoken abolitionist and activist in the Underground Railroad, he helped organize and build two churches in Georgetown, the Methodist Episcopal Church (1840) and the African Methodist Episcopal Church (1849). William Anderson‘s Underground Railroad involvement is outlined in his autobiography, available digitally through the University of North Carolina as part of the Documenting the American South Initiative. Elijah Anderson (no relation to William J. Anderson) moved to Madison in 1837 and lived at 624 Walnut Street. He worked alongside DeBaptiste and William Anderson as an Underground Railroad conductor. Elijah’s light complexion allowed him to pose as a slave owner and to travel with fugitives via steamboat or railroad all the way to Canada. He claimed to have helped more than 800 freedom seekers during his time in Madison. In 1856, Anderson was arrested on an Ohio River steamboat for transporting a group of enslaved African Americans from Lawrenceburg, Indiana, to Cleveland, Ohio. He was sentenced to eight years in a Frankfort, Kentucky, prison for breaking a Kentucky law against “enticing slaves to run away.” The day before Anderson’s March 1861 release he was found dead in his prison cell under mysterious circumstances. Chapman Harris, a native of Virginia, grew up hearing about the freedom African Americans experienced in Indiana and dreamed of someday living in the State. At the age of 37, he moved his family to a 40-acre farm in Eagle Hollow, a rugged and isolated area east of Madison. Shortly after his 1837 arrival, Harris and his two eldest sons began working with local Underground Railroad leaders. Known for his size and tremendous strength, Harris helped move freedom seekers along the Hanover route toward Lancaster, Indiana. Harris also met the famed abolitionist John Brown when he passed through Indiana a few weeks prior to the attack at Harper’s Ferry, Virginia. Eleutherian College, perched on College Hill in rural Lancaster. 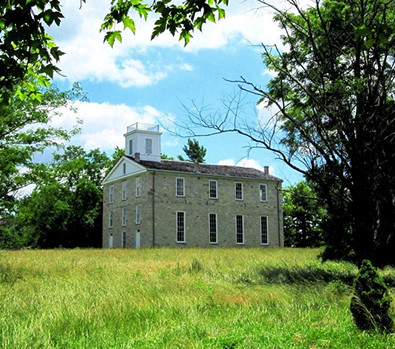 Located about 10 miles northwest of Madison, the town of Lancaster also has a rich abolitionist history. Founded by a group of New England Baptists with strong anti-slavery sentiments, the rural community of Lancaster became a center for abolitionist activity. A group of activists including Lyman Hoyt, Isaiah Walton, Dr. Samuel Tibbets, and Chapman Harris formed the Neil’s Creek Anti-Slavery Society in 1839 with members both religiously and morally opposing slavery. The Society even petitioned the Indiana General Assembly to repeal laws against harboring fugitive slaves and eventually set its sights on the national political arena when it aligned with the Liberty Party in 1845. Started by Society members in 1846,the Neil’s Creek Abolitionist Baptist Church wrote a disavowal of slavery into its official bylaws. 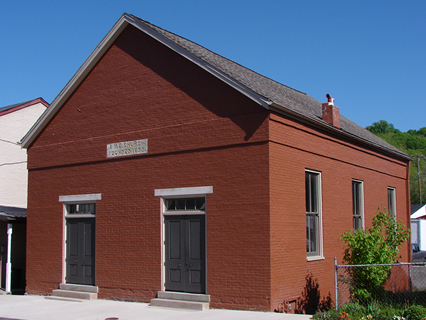 Much of the Anti-Slavery Church’s congregation was active in the Underground Railroad, offering shelter and transportation to fugitive slaves en route to Indianapolis. Members helped build Eleutherian College, founded in 1848 as the first higher education institution in Indiana to integrate by race and gender. In 1998, the Secretary of the Interior established the National Underground Railroad (UGRR) Network to Freedom Program, a program aimed at preserving, interpreting, and commemorating the history of the Underground Railroad. Through shared partnerships with local, State, and Federal entities, as well as interested individuals and organizations, the Network to Freedom promotes programs and partnerships to preserve sites and resources associated with the Underground Railroad and to educate the public about its historical significance. Eleutherian College, the Lyman and Asenath Hoyt House, the Isaiah Walton Home Site, the Dr. Samuel Tibbets Home Site, and the Tibbets House-- all in rural Lancaster, Indiana; the Chapman Harris Home Site and the John Gill and Martha Wilson Craven Home--outside Madison; and the Georgetown Neighborhood in downtown Madison are part of the National UGRR Network to Freedom Program and are recognized for their significance relating to the Underground Railroad.